One of the very best unique thing about android N is its tremendous, essential and awesome features that has been buzzling on the internet. Waiting they said is a procrastination that can eat deep into you. If your device doesn’t get the android N update and if you’re the impatient type or you do not have a Nexus device, then its probably hard to get to feel and get your hands on the Android N goodies. Also Read: How To Use Your Handwriting As A Font On Your Android Phone. But not to be disappointed if you’re running on a rooted Android phone and already have xposed framework installed, then getting your hands on the android N goodies is just a step away. 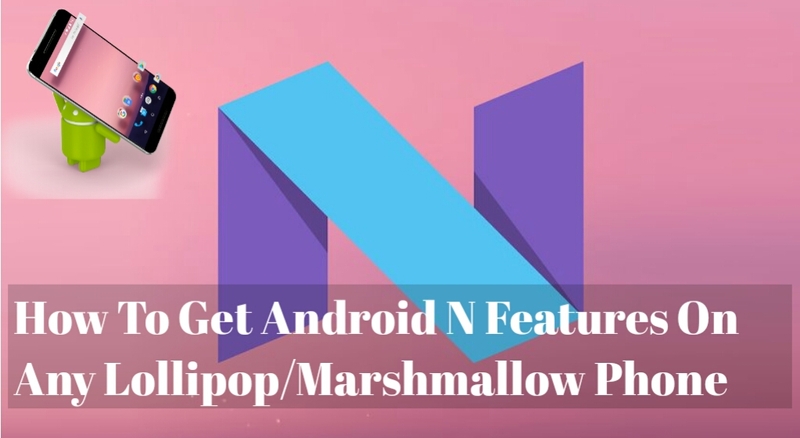 In this article we are going to look at the best way to get the extravagant features of the Android N on your Marshmallow or Lollipop phone using Android-ify. With Android N-ify you can possibly get most of the features of the Android N easily with a little bit of tinkering. What is Android N-ify And What Features Does it Contain? Android N-ify is an xposed installer modules that allows you to use several features introduced in Android N on your Marshmallow and Lollipop device. With Android N-ify, you can cook up you Lollipop and Marshmallow device to look like Android N. There’s alot of enticing features on the official Android N and naturally you can’t expect a simple xposed module to run all the feature. But all in all Android N-ify bring quite a few tremendous feature you do like to try. 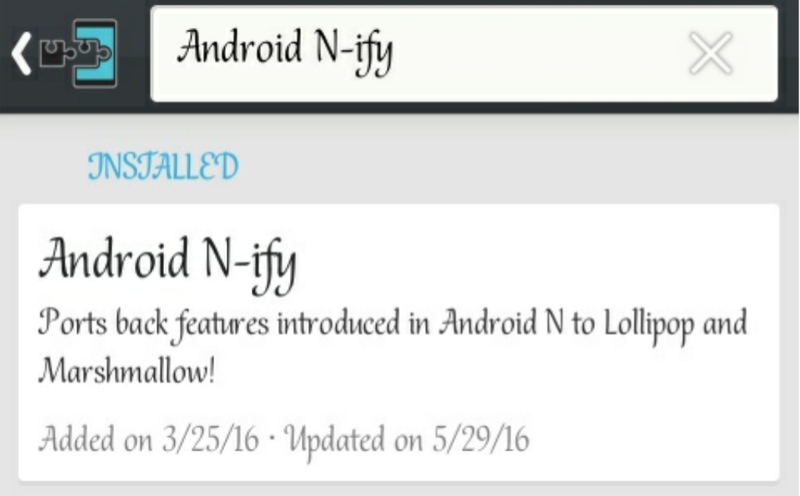 Below are the list of the features on the Android N-ify. Update and improvements according to Nougats source. With the upcoming features listed, below are the list of some of the features the developer termed impossible to invent. Data serverTall recents. (Can be made wider but not taller). Also the developer has announced that he won’t implement some features listed below. New Doze mode (Same as the ones on Greenify, ForceDoze, NapTime etc). For those who are eager to get the Android N features on there phone follow below steps or probably wait to get the Official Android N update on your phone. How To Safely Install And Configure Android N-ify. Make sure your android phone is rooted and have xposed installer perfectly installed. If you don’t have xposed installer, grab it from here. With that done, you’re one step away to get Android N goodies. Grab Android N-ify from here and install on your device. Android N-ify is also available on the xposed installer “download” section. Open the xposed installer and click on “Download”. On the search bar type in Android N-ify then tap on it, swipe from description to version then download it. Now after download completes, Launch the xposed installer and click on ” Modules” tick the Android N-ify to activate, go back and click on framework then reboot. After your device reboots, launch the Android N-ify and you will notice that the system tweaks are divided into sections namely: Settings, Recent, Status bar header and notifications. Now this is were the little bit of tinkering pops in. However the Recent, Status bar header and Notifications is were you’re going to find the N-like features. You have to do the tweaking to your preference and also keep in mind that you have to reboot your device for the changes to apply. Not to skip the precaution, the developer highlighted that the module is intended to work on near-AOSP devices and won’t work properly on ROMs that have heavily modify code like Samsung & LG stock ROMs for example. Also make sure you have your backup intact before tinkering with Android N-ify.